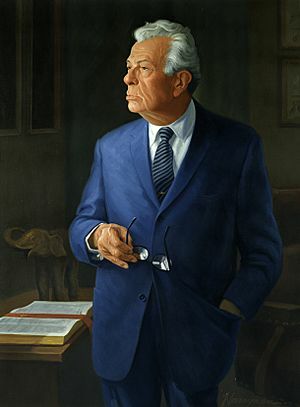 Everett McKinley Dirksen (January 4, 1896 – September 7, 1969) was an American politician. He represented Illinois in the U.S. House of Representatives (1933–1949) and U.S. Senate (1951–1969). As Senate Minority Leader for ten years, he was very important in the politics during the 1960s. Some things he did was to help passing the Civil Rights Act of 1964 and the Open Housing Act of 1968, both landmarks of civil rights legislation. He was also one of the Senate's strongest supporters of the Vietnam War and was known as "The Wizard of Ooze" for his oratorical style. Dirksen was a freemason. Dirksen died on September 7, 1969 in Washington, D.C. from lung cancer, aged 73. Senators Mike Mansfield (left) and Dirksen conversing in 1967. Statue of Senator Dirksen on the grounds of the Illinois State Capitol in Springfield, Illinois. President Richard Nixon paying his last tributes to Sen. Dirksen in 1969. Everett Dirksen Facts for Kids. Kiddle Encyclopedia.